But there’s a method to his madness, and that method could help us discern a path through today’s intertwined climate and energy crises to a sustainable future. We caught up with Cascio in the run-up to his talk tonight at Ensia Live, a speaking series in Minneapolis that asks what it will take to solve our biggest environmental challenges (Midwest Energy News is a media sponsor for the event). In the following conversation, which was edited for clarity and length, Cascio, a distinguished fellow at the Institute for the Future in Palo Alto, California, described paths to a sustainable world, the nature of world-changing ideas, and why talking about the apocalypse is boring. Midwest Energy News: A lot of the discussion around fighting climate change centers on cutting carbon emissions, thereby promoting renewable energy, as well as energy efficiency, increased gas mileage and much more. But you say this isn’t the end of the climate change story—it’s just the beginning. What do you mean? Cascio: I mean that we have to recognize that we’ve already done pretty substantial damage. Just because we eliminate anthropogenic carbon emissions, doesn’t mean that all of that damage goes away. … We’re looking at changes in terms of ocean acidification, in terms of the temperature bands where species can live. Just as an example of that, we’re starting to see some invasive pests showing up further north than they have in the past—bark beetles and the like—showing up in places they had never been before because it had never been warm enough for a long enough period of time for them to move in in the past. The carbon we put in the atmosphere is going to remain in the atmosphere for thousands of years—and here you want to put a little asterisk. There’s actually a range of technologies and technological practices that might allow us to accelerate the removal of carbon from the atmosphere, and from the oceans for that matter. That’s what they refer to as carbon-dioxide-removal geoengineering. Most of what people talk about when they start talking about geoengineering is what they refer to solar radiation management–keeping temperatures down. We know from what happens with volcanoes is if we put a lot of crap in the stratosphere, it will start blocking incoming sunlight pretty much immediately, [reducing global temperature]. Carbon dioxide removal, conversely, takes much longer, so it’s not something we can do to change things overnight. But of the two broad types of geoengineering, it’s the one that is less likely to have significant harmful side effects. When many of us think about the future, we extrapolate out from today’s conditions. But if you look back over the last couple of decades, you can see numerous events that few people expected, such as the Internet boom, smart phones, or the natural gas boom. 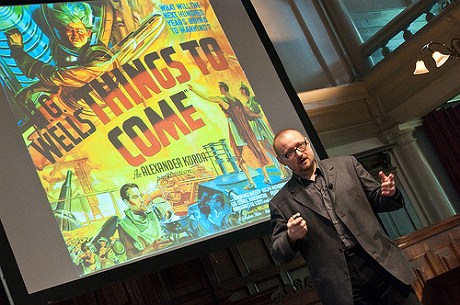 How do you, as a professional futurist, go about predicting the future better than the rest of us? Actually the term “prediction” has become something of a dirty word in the futurist community because of the implication it has of telling you the one thing that will happen. The term most of us tend to use these days is “forecasting,” which is a parallel concept, but the implications are less precise. You hear about a weather forecast, and you know going in that it’s not telling you what will happen, but that it’s a best estimate based on everything that we know. More critically, most professional futurists these days talk in terms of scenarios, of multiple possible futures. It’s irresponsible to say, here’s the one thing that you know will happen—end of story. You can only talk about multiple possible futures because of this potential for surprises, for complex interactions of disparate dynamic forces. In the late 1990s, people working on international terrorism forecast that Al Qaeda could use aircraft to attack the infrastructure of the U.S. They didn’t call out the World Trade Center or the Pentagon in particular, but they said, this is a possibility, so please pay attention. The analogy I really like to use is in my talks . . . is that foresight work is akin to vaccination. The way our immune system works, our bodies encounter a pathogen and we start to generate antibodies, in part to fight that pathogen, but also, if we encounter that pathogen again, we’re prepared to fight it. We jump-start that process with vaccination. We inject a denatured, weakened version of the pathogen so that if we encounter that pathogen in the future, our bodies are already prepared. What scenarios and foresight work does is tell you, here are a range of things, based on our understanding of social and technological processes, that are extremely plausible and even likely. And, if you start to pay attention to the leading indicators of these things, you can actually be better prepared to deal with them if and when they emerge. That prompts a pretty obvious follow-up. What are you spotting today that could make a big difference in that way? Any new, game-changing developments in the world of energy? There’s so much stuff in the labs right now boosting the capacity of solar power and boosting the energy density and storage capacity of batteries, that it seems very likely if you’re looking 10 or 20 years out that the prevalence of electric vehicles or hybrid EVs will be dominant. If you can boost the energy density—how much energy a given volume of battery can store—that’s when you start moving into the realm of, I can drive across the country on one charge-up because in same volume you’d have as a gas tank, my battery is holding so much energy. The transformation around energy storage is on the near horizon. That also has really interesting implications for the energy industry. If you can very easily store an overproduction of solar or wind to be able to then put it on the grid at night or when there’s a lull in the feed, you’ve solved the intermittency problem. The fact of the matter is that one square meter of land gets a kilowatt of energy from the sun. We have an extraordinary amount of energy hitting the planet all the time. If we just capture a fraction of that and have the ability to store it for use when we need it, a lot of these energy questions just become moot. And all of the pieces of that puzzle are at the very least on the drawing board, and most of them are in the labs. We really are less than a generation away from having access to this pretty profound transformation of our energy system. If you start looking at efficiency, there’s some really fantastic work being done boosting energy efficiency. When you couple this shift to renewables with easy, high-density storage and decreases in moment-by-moment demand without decreasing your quality of life, then you really have the potential for something transfigurative. You titled your talk, “Bots, Bacteria, and Carbon.” It seems to me that the carbon is pretty intuitive, but where do the bots and bacteria fit in? The bots and bacteria are really about the kinds of big changes that we make to our economic and technological infrastructure. Are we moving toward a world where we have such high-quality artificial intelligence and robotics that a lot of our work is done for us and you can increase the efficiency of things that way? Or, are we moving toward a world where material technologies you can think of are replaced by biotech? What I’m presenting is a set of different visions of what a sustainable future could look like. Is it essentially trying to keep it as close to business as usual as possible? That’s the one that will probably rely heavily on high-energy-density batteries. Or is it a world that has so profoundly changed our relationship with information that we are able to track and manipulate our uses of energy such that we can control them with such precision that we can reduce waste to essentially nothing? What we often think of as waste really is underutilized resources. If you’re throwing anything out, you’re making a mistake, is the underlying argument. What comes to mind is industrial ecology. Turn that into something 100 times more powerful, with digital systems that have increased our ability to manipulate the flows of materials and energy. For example, there’s a whole lot of waste energy in our mechanical systems that gets turned into heat [and gets wasted]. Why aren’t we using that heat with thermoelectric systems? If you are running off a battery, every little thing trickling into that battery helps to extend its life. If you have a thermoelectric system throughout your car, you can actually be extending the charge life. Kind of like cogeneration all over the place? Exactly. That’s the kind of thing that goes into this kind of world. It’s very much a world where everything is smart and everything is active and reactive. The roads are covered with some combination of paintable solar cells and piezoelectric pressure-based generators. If you go down the list of things that seem kind of science fiction-y, what happens when these become reality? None of these are scenarios of the world falling apart, and that’s not because I can’t think of scenarios where the world could fall apart–that’s a very distinct possibility–but because talking about disaster is boring. Talking about the apocalypse gets dull. Tolstoy had this really great line: All happy families are the same, but all unhappy families are unhappy in their own way. If you flip it, all apocalypses are the same, but all successful scenarios are different in their own way. We could spend all day talking about the apocalypse and not get one step closer to avoiding it, but by talking about different scenarios of success, it helps us identify what we’re doing now that could lead us to one or more of these successful outcomes. It’s really easy in the moment to say we’re doomed because there has not been that obvious shift in public action. But it’s a mistake to confuse what we see in the moment with what’s going to happen in the years to come. What do the best world-changing ideas have in common? Do they have characteristics that could help us recognize them when they are fighting for survival in the marketplace of ideas? I guess the one thing that most of them have in common is connectability. These are ideas that can be linked to other ideas. These particular ideas and models work well with a variety of other ideas, models and tools to be able to do something that is greater than the sum of the parts. One thing that most world-changing ideas should have is economy of scope. Economies of scale are where, as it gets bigger, you can do a lot more than just the sizing up would imply. Well, with economies of scope, you can do more as it gets wider. These are solutions that apply to an array of issues. The canonical example is a curb cut. It was originally designed to help people in wheel chairs, but it’s really useful for people pushing strollers, carts and hand trucks, even if that wasn’t what it was originally designed for. You can do a lot more with it than you think you can at the outset.